Last year I saw the wonderful Purple Pilgrims playing with Gary War. They sounded ethereal, heavenly creatures from another world (actually Christchurch via Hong Kong ). Gary War in contrast was messy, harsh electronica. They share an EP (see above pic). After the gig I started this mix. Purple Pilgrims played last week at St Kevin’s Arcade here in Auckland as part of the May day celebration. Again a real treat and I was inspired to finish this mix. Big fan. She has recently left her country roots and has gone grungy. The pic is Anthony Perkins and Audrey Hepburn from Green Mansions. It’s a terrible film . 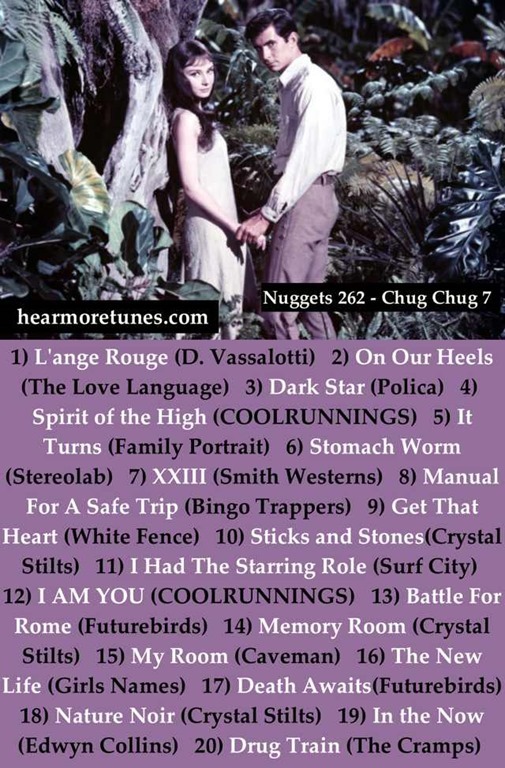 This mix gets off to a cracking start with an excellent track from D. Vassalotti, then a recently released but old track from The Love Language before the keyboards of Polica start up. Crystal Stilts have another album out. As you can hear in the interview below, they have taken their time. I love that dreamy jangly sound even though they can be a bit bloodless. And here is their current album. White Fence, “Get That Heart” from Impose on Vimeo.